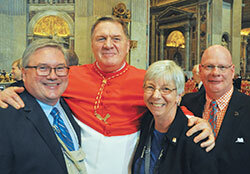 Greg Otolski, left, archdiocesan director of communications; Cardinal Joseph W. Tobin; Theresa Brydon, executive assistant to the cardinal; and Loral Tansy, who has assisted Cardinal Tobin as master of ceremonies during liturgies in the archdiocese, are pictured in St. Peter’s Basilica at the Vatican on Nov. 19. ROME—The stories have flowed easily. Some melt your heart. Others bring a smile or a laugh. All share an insight into the qualities that make Cardinal Joseph W. Tobin respected and loved by many people. As friends and family members have traveled to Rome this weekend to witness him be installed as a cardinal by Pope Francis on Nov. 19, here are some of the memorable stories that were shared about Cardinal Tobin. The smile keeps growing across Carolyn Noone’s face as she recalls the remarkable moment from the evening of Dec. 3, 2012—when Cardinal Tobin was installed as the archbishop of the Archdiocese of Indianapolis. As director of special events for the archdiocese, Noone had arranged a dinner for the archbishop, his family and some of his friends at a downtown Indianapolis hotel. So Noone and Annette “Mickey” Lentz, chancellor of the archdiocese, went to the hotel to make sure the dinner was enjoyed by everyone. “After dinner, most of the family went into the foyer,” Noone recalls. “There was a grand piano there. His sister, Ann, went back into the banquet hall and said, ‘Joe, you have to come out to the foyer right now!’ He said, ‘I always do what my sisters tell me to do.’ Then he sat down at the piano and began to play. Holy Cross Father Joseph Corpora became friends with Cardinal Tobin “a few summers ago” at the University of Notre Dame in Notre Dame, Ind., for an event involving the college’s Alliance for Catholic Education (ACE) program. “I had the good fortune of being his host,” Father Corpora notes. “One evening, we sat and talked for about two hours. Since then, we’ve had several lengthy conversations. On two occasions, he and I went out to eat at a Mexican restaurant in Indianapolis. He made a point of talking personally with the waiters and the staff. In everything that he says and does, he is very human. His very person invites confidence and trust. Msgr. William F. Stumpf, archdiocesan moderator of the curia, recalls a conversation he had with Cardinal Tobin shortly after it was announced on Nov. 7 that Pope Francis had reassigned him from the Archdiocese of Indianapolis to the Archdiocese of Newark, N.J.
First impressions often last, and Loral Tansy will never forget the first impression that Cardinal Tobin had on him. The moment occurred during the first Mass that Cardinal Tobin celebrated in one of the parishes of the Archdiocese of Indianapolis after he became the archbishop. In his role as master of ceremonies, Tansy is responsible for making sure the Mass runs smoothly when the archbishop celebrates the liturgy. So he was intent on getting the Mass started right as he and the archbishop processed up the main aisle. Yet halfway up the aisle, something happened that changed Tansy’s plan. “There was a handicapped boy in a wheelchair midway up the aisle,” Tansy recalls. “As the archbishop started to go by, the child raised his hand, and the archbishop took his hand. The child started talking to him. The archbishop got down on one knee, and carried out this conversation with him.